Welcome to the Incarnate Process episode 7 – Apsu Concepts. High King Apsu plays a critical role in the story and the game (title still TBA). He is by far the most developed character, and we are excited to show you the beginnings of his design! Below is one of the descriptions that was submitted to Dylan Pierpont on High King Apsu used in the design process. You may notice in our description that we reveal the name of the source of Foci called Ylem. Ylem is the underlying energy that formed the very fabric of reality. We will learn more about Ylem and the other Foci as we continue in the episodes. Apsu looks like he is in about his mid 30s, 5’11”. There is some age to his face but not so much that it is distracting. His skin is a dark tan. His hair is naturally curly, very dark brown. His eyes are a very rich almost glowing blue, due to his alignment with Ylem. He has no facial hair. He has the appearance of being noble, that he is wise beyond his years [spoiler removed]. He is not so much “handsome” so much as he is “distinguished” looking, he as average looks but anyone can recognize that he is well respected, he is the High King of Aeterna after all. He still likes to have his robes/clothing reflect Babylonian influences, but also show that celestial power that comes with having become Ascendant. One of the most important features of Apsu is that he loves to project Alchemy in his style. Alchemical symbols are very important to him, they could very well be on his clothing, tattooed to his skin, or even hanging off of – or tied onto – his clothes, necklaces, bracelets, earrings, etc. The most important symbol is for Ylem. 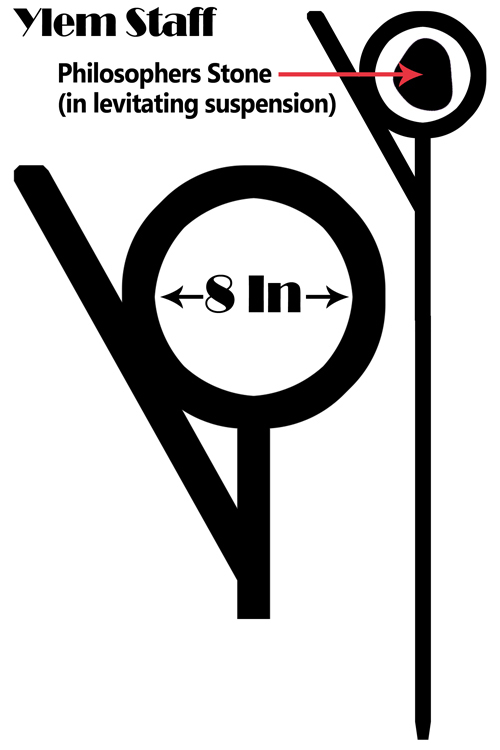 This symbol can also be seen in the form of Apsu’s staff OR scepter (meaning smaller staff in this case). His staff/scepter should be similar to this shape. The circular portion of the staff would not be too much larger than a fist sized stone. It is the philosopher’s stone which is socketed in free levitating suspension within the center of the circular finial of the staff. The staff can be made of any substance. The philosopher’s stone inside the circle can have symbols on it but is not necessary. These are the only building blocks for Apsu that I would like to have integrated into your designs. Anything I didn’t mention is purely up to your creative ability and awesome imagination. I’ve been thinking about Apsu, any method you would like to realize a “Babylonian king” style merged with an “Alchemy style” is fine with me. I realize that may be an abstract, generalized description but it is the inspiration within Apsu’s makeup. I wanted to make sure that “High King Apsu” also is wearing a crown, it should be a pronounced aspect of his design. I’d like to see three different crown designs if possible, a babylonian style, an “Atlantis” style (whatever that means, if possible) and a third “Dylan style” original concept. Here is a quick diagram for the Ylem staff for Apsu. I don’t want to take any creative freedom away so its very basic, I just wanted to demonstrate the proportion of the staff. The staff can be as long as needed, just so long as the finial is proportioned right for the philosopher’s stone. Also the stone can be in whatever shape or design you’d like. I took the size into account but I did want to try and see what he might look like with a full length staff rather as well as a smaller scepter. The right design is probably closest to what you imagined as far as dimensions go. I’m also thinking we could pull on an effect where the staff has constant streams of water floating up and dissipating. We could even try a version of this on the crown. I’m imaging the material would be similar to what we’re doing with Engur where the base material is water, but there are sections or pieces of real metal binding the solution together. All together I went with fairly traditional Babylonian robes for all of these. The difference comes down to the alchemic symbolism and the layering of the fabrics. HahahhahahaHAAAAAAAAAAA! Completely awesome! After seeing the full staff the scepter just isn’t good enough anymore. I cant stop looking at the middle Ylem Staff, very impressive work. I think I would like to see a series of staves that are the same dimensions of the one in the middle, with different designs. How many Ylem Staff concepts should you make? Perfect representation of Babylonian robes as well. 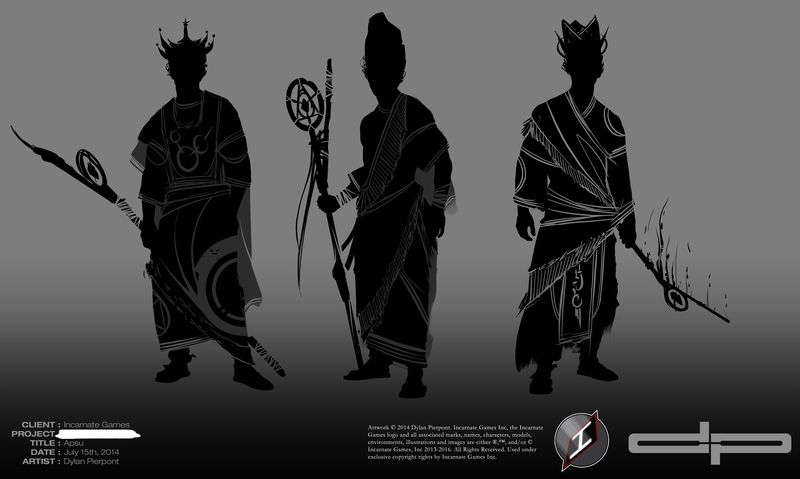 I like all the robes, I really like the large circle design on the leg of the one at left. I think we have enough options for the wardrobe to mix a few of these together. The molecule looking circle design made me think that perhaps he wore necklaces with hoops of those three different sizes on the end, accomplishing the same look. The crown in the middle is very clearly a Babylon look, its good. The crown at right looks like it has potential but its hard to tell without more detail. I think the one at left is my favorite. My favorite element of it is the central funnel shape with the pointed finial design on the top, I’d also like to see more iterations of that general idea. The upward stream of dissipating water idea, or that style of the rising fire-ish shapes on the scepter at right are good ideas for the staff. I’d also like to see the idea you explained about doing a crown in that way too. I’d like for the crowns to be put through more iterations. Let me know what your thoughts are for scheduling concept sheets for more iterations of Ylem staves and crowns, I absolutely must see more. Stay tuned for EPISODE # 008: Kynazarr Tonals which will be posted soon!